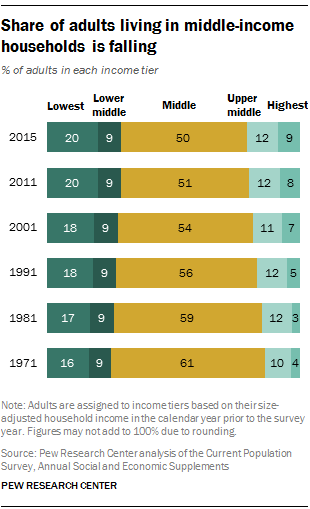 Is Life Getting Better (or Worse) for the Middle Class? Guess what Americans? 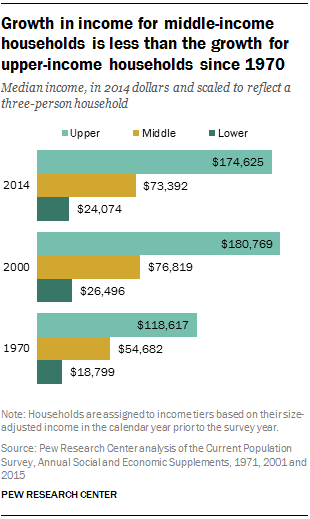 Odds are, you’re probably not a part of the middle class anymore. And if you are, you’re probably falling further & further behind, relatively speaking, every year. The silver lining? It may not be all that bad. The real ugly bit comes at the absolute lower-end of the economic spectrum, where 20% of Americans currently find themselves. That’s up from 16% in the early 1970s. 9% are among the highest tier, which is up from 4% roughly 45 years ago. The real finding here? That America is becoming increasingly polarized & a lot of people are getting caught in the middle of an economic rip tide. The big question, of course, is why & how, is this happening? The crux of the issue is inequality, which is finally being addressed & acknowledged by those w/actual influence. Of course, it’s unclear if there’s an actual solution to it, or if there are policies that can be enacted to help rebuild the middle class. These graphs demonstrate the issue & don’t leave much room for optimism. And truthfully, w/the world on the brink of mass automation, coupled w/the aforementioned political environment, there’s a lot to worry about. Jobs are going to be come even more scarce & the continued targeting of social programs & safety nets could lead to significant struggles for the remaining middle class. Not to mention those who have already been pulled down a rung. But still, we can’t completely ignore the positives from Pew’s report, those being that there are a good number of households that are making headway up the economic ladder. And, as the report noted, the share of people improving their standing are outnumbering those headed in the opposite direction. So, that’s some good news. Even so, what we’re seeing is the whittling away of the middle class that has traditionally made up the backbone of the American economy. These are the people who make up the majority of the population, driving production & economic growth, embattled in large-scale free market Darwinism to out-compete each other for raises, promotions, etc. The question is: what happens when this core demographic disappears, or becomes too small? Nobody really knows, & given the drastic changes that the American economy has seen over the past generation or 2 – & the even bigger changes it’s going to experience over the upcoming generations – it’s hard to really have any idea what’s going to happen. When it comes to this Pew report, you can look at it from a couple of different perspectives. You can be emboldened by the fact that middle class Americans are finding ways into the upper tier, or you can be dismayed at how many people are slipping behind. It’s a tale w/2 potential narratives. Well, it’s good to read a non biased article that at least attempts to focus on the positives. It can be a bit difficult to focus on the positives when you realize our incomes have decreased some 28% while the cost of goods has increased significantly. That just doesn’t work out well on paper.